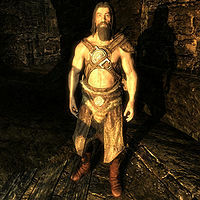 Hewnon Black-Skeever is a Nord warrior plotting to overthrow or undermine the Thieves Guild in the entrance to The Ratway. He can be heard scheming with Drahff about some indiscernible plot. They will attack you on sight. Hewnon wears a set of hide armor and a pair of normal boots. He is equipped with a leveled mace (up to elven quality), and a leveled heavy shield (up to steel quality). He carries one random leveled potion or poison, a 25% chance of a lockpick, and a leveled amount of gold ranging from 25 to 125 gold. Hewnon and Drahff were not always supposed to attack you on sight. See this section for details. Esta página foi modificada pela última vez à(s) 23h28min de 2 de janeiro de 2014.